It ain't summer here in Copenhagen. But it is, apparently, quite a lot of summer on Burleigh Beach in Gold Coast, Australia. Bastards. Spotted on I Bike NZ's Flickr photostream via the Bike Friendly Northshore blog. Where there is Yin, there must be Yang. 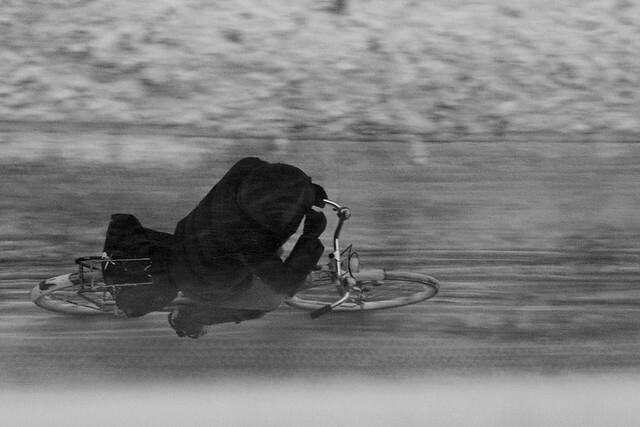 Here's some Aerial Cycle Chic from the Copenhagen winter the other day. We've gotten the yang of this winter thang. I laughed out loud when I saw that first one – either that had to be from the archives or that was one very brave soul! Gold Coast .... Queensland .... lucky bastards.... Really? Hmmm. Poor bastards is more like it at the moment. yes, jennifer, it's tough across many parts of queensland. although this photo was taken yesterday, so it looks like the Gold Coast is not suffering from the floods. It's always true, in summer you see more of your friends! But where it's winter right now that yangthing is not so much!